Enjoy horse riding in one of the most beautiful natural landscapes and the territory of a large predator, the mythical wolf! 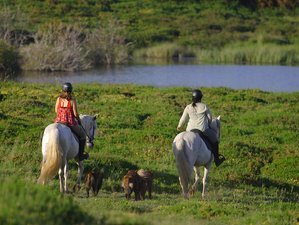 These riding holidays are designed for true nature enthusiasts who wish to enjoy the calm, contemplate natural jewels of the Iberian peninsula and observe the landscapes in the company of a good horse. The landscapes feature the natural pools of the Laboreiro river, hot water thermal baths, ancient paths, and of course one of the main peaks in the park, the Peneda Mountain. For your comfort, you will stay in a beautiful guesthouse, ideally located in a wonderfully peaceful spot. Ecotura Country House is a traditional mountain house, built in the early twentieth century and recently restored. Although in the essence maintaining the original features, the Ecotura Country House is equipped with all modern comforts that enable visitors pleasant moments of leisure. Located in the historic village of Castro Laboreiro in the Peneda-Gerês National Park, this house is surrounded by the purest nature that you can find in Portugal. Ideal for a retreat and rest from the stress of the city, it allows you to enjoy the fully-deserved holiday with family. It is still the premier venue for your adventures on the mountain. Once lodged in Ecotura Country House, you can take advantage of special prices in all outdoor activities of Ecotura. The house is equipped with central heating, fireplace, free Wi-Fi, TV with cable channels, and fully equipped kitchen. Extra bed is available only for children up to 15 years. In your exploration of this peaceful region, you will explore the signs of the wolves' passage, visit Fojos (ancient stone traps to catch the wolf), and will talk about the history and legends surrounding the species. You may be treated to one of the most enchanting sounds in nature, the howl of the wolf. The itinerary for Gerês wolf and wild horses tour can be adapted to the weather or other local conditions, but during your stay, there will be a combination of half-day and full-day rides. It is possible to have additional riding, riding lessons, or woof trimming lessons (extra cost, payable locally) in place of the non-riding excursions. Please note, the following are example itineraries and are not exhaustive. You will be transferred from the airport to the village of Castro Laboreiro. Dinner will be served at Ecotura Country House. You will meet and pick the horse followed by your first ride on the beautiful paths of Peneda Mountain. After the ride, a typical lunch will be served in a local restaurant. There will also a visit to the reception center of the national park for a better knowledge of the region and the biodiversity of this natural area. After that, you will enjoy a sunset ride for tracking and follow a wild Garrano horses herd. You will ride until the border east of Portugal. The herds of wild horses from Garrano breed and the megalithic monuments which constitute the largest megalithic necropolis of the Iberian Peninsula are your aim. Lunch will be served on the mountain. This has the possibility of riding long canters.On Tuesday you will have meditation class. You will enjoy a morning ride for a canter in the mountain followed by a lunch in a local restaurant. You will visit the old part of the historical Melgaço village with the castle and the old churches. You will stop in Alvarinho presentation center to try out this wonderful fresh local white wine. Alvarinho wine is a richness of extreme rarity. A typical Portuguese wine, the Alvarinho cast is both one of the most important varieties of the Tart Wine Region and one of the internationally prizeda, a truly top quality wine. Dinner will be served in the house. In this day you left behind the top of the mountain to ride in the hill of Monteiro area in direction of the winter valley. The dramatic landscape with the granite rocks will mark this day of incredible sight seen. You will cross the beautiful old hamlets full of history and traditions. You will enjoy the lunch in the mountain then return by the trail of the ancient transhumance. In old times, this path was also a connection to Spain. There will be a morning visit to Castro Laboreiro Medieval Castle and Peneda pilgrimage sanctuary and village. This huge and beautiful sanctuary in the middle of the mountain was build in the 18th century. Lunch will be served in Laboreiro river near a natural pool with an extraordinary roman bright. Swimming in the natural pool is possible. After lunch, there will be an afternoon ride. On Friday you will have pilates relaxation class. You will ride towards the fabulous Valley of the Wolves. This last ride of the week takes you in direction of one of the most beautiful valleys of the mountain. Full of biodiversity, this area is rich in rare sightings of wild animals. Last but not less important, in this valley, you can spot the best wild herds of Garrano horses of all region. You will enjoy the lunch on the mountain and dinner in the house. The Peneda-Gerês National Park is about 70,000 hectares protected area positioned at the border of Portugal and Spain adjoining the park of Xurês of neighboring Spain. Located in a mountainous region with the altitude differing between 700 meters and 1,500 meters. It has varied habitats which includes dense oak forest and high granite mountain landscape. This national park is home to two most endangered species of mammals that’s the Iberian wolf and the wild horses namely from the race called Garrana. Close to the northern border between Portugal and Spain lies the Peneda-Geres National Park, a region of varied habitats which range from the high granite mountain landscapes to dense oak forests. Not only is this a beautiful natural landscape, but it is also the territory of a large predator, the magical Iberian wolf, a species which the hosts here have studied closely for several years. In addition to the wolf, the wild Garrano horse also roams this area freely. The rides often pass herds of these horses which is a wonderful sight to behold. They are in the origin of Mustang horse. Some of the riding horses used are also from the Garrano breed (the others used being Lusitanos, another Portuguese breed). The riding takes you through the oak woods and groves of birch, a natural shelter for roe deer and wild boar, as well as patches of chestnut and holly trees which are inhabited by squirrels. Jays and Orioles rest along the cliffs where you might also catch a glimpse of an eagle and some rare species of crow. During the holiday, you will be served breakfasts, six lunches, and seven dinners. The goat milk and lavender handmade soap are produced from natural products. The honey produced by Ecotura in organically way, homemade jams, and marmalades are what you will find in the breakfast and are some of the treats that Ecotura has reserved for you. In the garden surrounded by one amazing oak forest, you will find the ideal place for your breakfast or for the book delayed for so long time. As a company, you will have the chirping of numerous birds that make their home in the oak forest or the bucolic sound of bells from the cattle that are grazing nearby. This holiday is available from April to November, with arrival on Sunday. Please select an arrival date below.